After finishing the restore on my JD, the top half of the Deadworld globe fell forward and got stuck. The Deadworld assembly then jammed and stopped turning altogether. Most of the gear issues with JD seem to be with gears slipping on the shaft. My issue was the opposite - the gear is solidly on the shaft. So solid, in fact, that it was easier for the brass gear to get stripped of its teeth. I haven't seen any topics discussing how to fix this type of gear issue. What are my options? 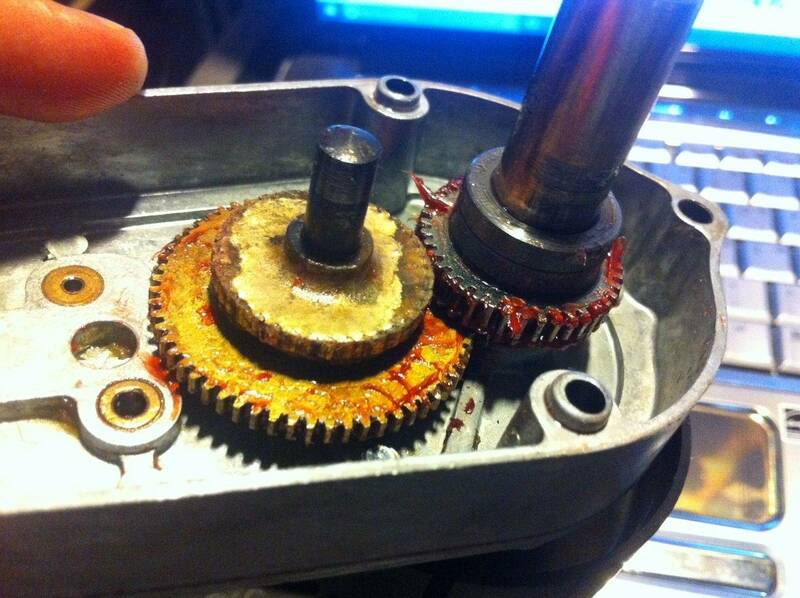 I know I can buy a new gearbox from Marco as a last resort, but I would prefer to fix this gear if possible. A new gearbox from the US would cost me over $500 after shipping and I simply do not have that kind of cash. Steve Young at http://www.pbresource.com rebuilds them. Thanks for the advice guys. I know Steve can rebuild them but with postage, return postage, and the exchange rate, it isn't very economical for me. Hoping to see if anyone had any success recreating it manually or if there was an off-the-shelf part that can be used as a substitute. Maybe ask if Steve will sell you the gear you need? Good idea! I will see if he sells it separately. Question is do you have the ability to get the worn brass gear off and the new brass gear pressed on? Maybe you can just send the gear shaft, rather than the whole gear box? I'd love the possibility of a gear set for these things. I've got two or three gearboxes I'd like to rebuild. When I asked Steve some time ago about just buying the gears separately, he said no. I would be stunned to hear that Bally/Williams had a custom made gear for this application. They likely used an off the shelf gear that was already available. Gears are so common for so many industries. Look at a supply company like Grainger (https://www.grainger.com) and see the available gears. Also, I would assume that Bally/Williams used the cheapest gear they could find, a few pennies in price actually mattered to them. But for one of us in the hobby paying an extra dollar or two for a high quality steel (or brass) gear would be no big deal, you could probably get a much better than original gear for a relatively low cost. Even if you can't find a perfect replacement for the stripped gear you can probably find two new gears to put onto both shafts that are the correct matching diameter/tooth configuration so they will mesh with each other and replace the stripped gear and the gear that stripped it. Just make sure the two radiuses (sp?) of the gears add up to the right amount relative to the distance between the two gear shafts. So what if they are a slightly different ratio, the planet might end up spinning at 4.1 or 3.9 RPM instead of 4 RPM (or whatever it happens to spin at). All of that said, for a single installation it might not be worth the time and effort to figure that out. Though for someone like Firebaall it might be worth while if you have a few you can repair. 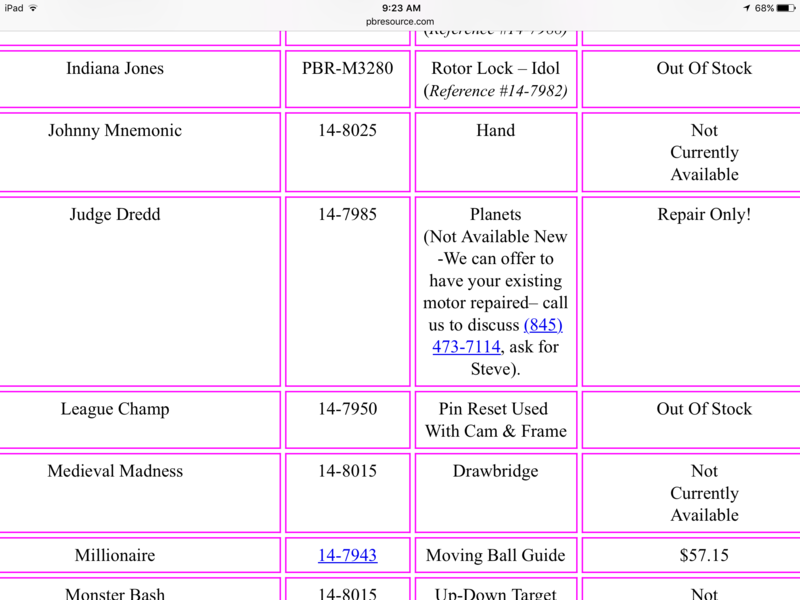 Check pinside "parts for sale"
PBResource will only repair it as long as no prior makeshift repairs have been attempted. I have fixed one myself by soldering the gear to the shaft but it was very hard to get the gear straight. When all else fails a new gearbox is now available. It was actually custom ordered. I contacted the company that made them, asking for the the gears. They told me all the plans/parts were shipped off to one guy. He then gave me Steve's name and number. I am very surprised to hear this. Gear drive motors are so common for so many applications I don't know why they would not use an off the shelf product for both cost and speed of availability. There is a pile of space to fit in the motor, no need to make some fancy/odd shape to fit an impossibly tight area. Not having a gear assembly to look at, I can't even begin to make a recommendation on where to look for gears. Personally, I am spoiled with having a full machine shop at my disposal and cutting gears is not a huge issue for me. But such work is a labor of love and takes a lot of time for a one off gear. I would encourage anyone to try and figure out how to get your gearbox to Steve Young (there must be a cheap, though perhaps incredibly slow way to ship to the US). I have heard the price he sells a fully rebuilt gearbox for, at it is a bargain and it should be better than factory. Same thing happened to me, and after making a lot of the same inquiries(including to clock repair shops,) I decided to open up a an old gear box to check gear sizes. Well I got lucky as the reducer gear was same size and only simply pressed on. I have no idea what game the salvaged gear box was off, but it did confirm that it can be found in other machines. Sadly, Not sure there is a cost effective way to pursue that remedy, unless you have the spares and can pop them open. Additionally, I thought I just saw a whole dead world motor assembly for sale, even had a pic. I'll scrounge around my history and see if I can find it. Yeah, I bought an extra gear box from a fellow Pinsider. It worked well enough, but there was a definite stutter that I observed during a power test. Rather than put a mostly working part in, I thought it would be better to rebuild. ...now I just have to get around to packing up and sending them away. "new design" it says. I'm not sure what that means exactly. I wonder if they would sell the whole gear set separately??? Nobody seems to be talking about this item.